Joel and Loriann are friends of ours working in the Ukraine to engage people with the gospel. Their testimony, below, is sobering and incredible at the same time. The opportunity for the sake of the gospel there is amazing and Joel and Loriann are a tangible reminder of what it means to live the gospel. We wanted to share their testimony as an encouragement to you and to remind you to keep the people and Church of the Ukraine in prayer during this critical time. What an amazing week it has been! We literally could have sent out updates every hour or so over the past week and we wouldn’t have been able to keep you all up to speed. Things have been happening so quickly around here. The bottom line is, the fighting and violence has ended here in Kiev and in most every other city in Ukraine. For this we are thankful! However, before I get into all the changes taking place here, Loriann and I want to thank each of you who wrote with kind words letting us know you were standing with us. The letters of support and assurances of your prayers overwhelmed us. And to the many more who may not have written but have not ceased praying for us and for the people of Ukraine during these last weeks, we cannot thank you enough. Our Sunday class this past week with the young people at church was very good. There was much relief that the fighting and violence had ended but also an acknowledging that even during the worst of these times, so many saw the Lord working in lives and waking up not only the Ukrainian church but the global church as well in prayer for Ukraine. A number of the young people asked, “Why did it take something like this to get us to start praying for our country?” (or for many Americans to start praying for Ukraine!) I was able to talk about how God is sovereign, and because He is sovereign he is in complete control over every situation. And even in the desperate, horrible times Ukraine has been going through, God has and is going to bring good out of it. I gave them Pastor Ron Dunn’s words, “Good and bad run on parallel tracks and often arrive about the same time.” No matter the situation, God is going to receive glory from it. This is what makes Him so trustworthy! And this is what we’ve been seeing in Ukraine since everything here has transpired. As I’m sure you are all aware, Ukraine is under a new government now. Last weekend the former president, Viktor Yanukovych left the capital, Kiev for eastern parts of Ukraine. This was after he had signed an agreement with the opposition, which put an end to the fighting and was to transfer much of the president’s power back to the parliament. By Saturday evening it became known that Yanukovych did not just travel to eastern Ukraine to attend a meeting but was in fact attempting to flee the country. As of today he is still missing. Due to his leaving the capital and in every sense of the word, the presidency, an interim-president was appointed. The new president then ordered the parliament to put together a new government (i.e. president, prime minister, cabinet,) by the middle of this week. Just last night the new president and cabinet was introduced to the people down on Maidan Square. This is a huge turn around from just one week ago! While Ukrainians know that there are many hard days ahead, for them this last week, and the changes it has brought, has been some kind of miracle. Even those who began the protests in Kiev last November, could never have imagined that the country would be where it is today. But as we know, this all came at a high price. 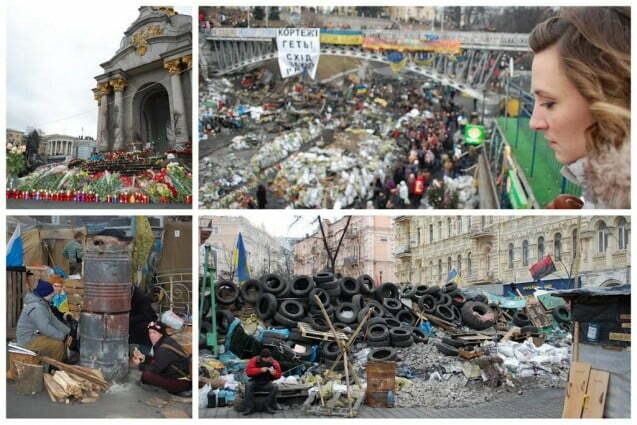 There were 88 known to have died in the fighting on Maidan Square. Today these men and women are looked at as soldiers who died for liberty. On Tuesday Loriann and I went down to Maidan Square to walk around, pay our respects to those who died, and try and get a sense of what this was all about. 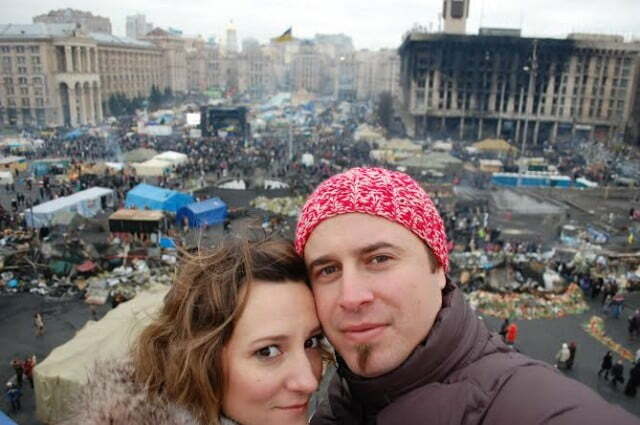 Before any of you start freaking out, Kiev and more specifically, Maidan is perfectly safe. The fighting has completely stopped and the government forces who were doing most of the shooting and killing have been disbanded and removed. While we were in downtown Kiev, we didn’t even see so much as a police officer. The protesters are being very peaceful and now they have turned into the guards and security for the various government buildings and even standing guard in front of banks and other such businesses. While there are still thousands of protesters still occupying the square, they are not actively protesting anything right now, they are simply there to occupy and hold the establishing of the new government accountable. As you will see in the pictures we are attaching, the square, while still looking very much like a battle zone, has turned more into a living memorial than a protest camp. In fact this was something that surprised me while we were down there. There were literally thousands of people doing exactly what Loriann and I were doing; walking around, taking pictures, placing flowers at various barricades and memorial sites. Other than the guys who were still in their fatigues and body armor and who were holding their batons or bats, it was hard to differentiate between who was a protester and who was a visitor. The square and all of Kreshatik Street were still lined with tents and soup kitchens, indicating that people were not going to leave any time soon. Most of the big green army tents had signs on them letting you know what region or town in Ukraine the occupants were from. The soup kitchens were also manned and supplied by various cities and regions of the country. The soup kitchens were not only feeding the protesters but anyone could walk up to any of the kitchens and grab a plate of food or a sandwich to eat. There was a sense of camaraderie and togetherness while walking through this tent city within a city. Something else we sensed while walking was that people weren’t ready to let go and move past these protests. There was a feeling of relief that the fighting had ended, a joy that the old regime had been dismantled, but also a feeling of needing to keep their Square just as it is (in all it’s war zone ugliness) as a way of honoring it’s dead. The Slavic people have always put a strong emphasis on honoring those who died in battle. We came away from Maidan Square feeling that this is what this protest camp had turned into, a battle field memorial for those who died. The next few months leading up to the snap elections scheduled in May, will be very critical months for Ukraine. Even now there is reverse protests in some parts of eastern and southern Ukraine, those parts that have traditionally looked more to Russia than to Europe. There has also been some blatant saber rattling by Russia, which is none to happy at the way the events of the last week have played out. While peace and calm have been restored in the last few days, there is still great potential for further unrest and fighting. So we ask you to please continue praying for Ukraine! We are not out of the woods yet. As we said above, the church seems to have taken these events as a wake-up call. This is a very good thing! Pray for the church as it mobilizes and seeks to help and assist not only in the social rebuilding of the country, but also the spiritual saving of men’s souls. Pray also for the new government. As the new president said yesterday, this new interim-government will not be able to please everyone all of the time. It will seem like a lose-lose situation for them. Pray also that the outside influences (east or west) would stand back and allow Ukraine to decide it’s own direction and not try to force, coerce or intimidate Ukraine in the direction that one side or the other wants. For hundreds and hundreds of years, Ukraine has been in the middle of a tug-of-war, pulled one way and then the other. And then lastly we ask that you would pray that the Gospel would find open hearts. Ukrainians are fed up with corruption; they are ready for a new way of life. Please pray that many would be open to the new and different life that can only be found in the person of Jesus Christ. We again thank you for your prayers and support. More importantly, the people of Ukraine thank you.